I read this article and found it very interesting, thought it might be something for you. 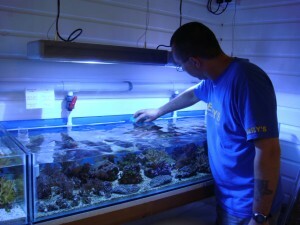 The article is called 10 Tips for Setting Up a Reef Tank and is located at https://perrysaquaticscentrelincoln.com/10-tips-for-setting-up-a-reef-tank/. 1. The first and for most important thing when setting up a reef tank is RESEARCH! I cannot stress this point enough. You must read, read and then read some more. You can search the internet or ask the advice of specialist at a Lincoln aquarium or aquatic centre. Also there are many books available on the market which you can purchase. (Check out our selection of aquatic and fish keeping books here) You need to think about what fish it is you want to set up your reef tank with and weather you want live rocks and corals in your reef tank. Once you know what stock you want to set up your reef tank with you can look into how best to care for them and what requirements you need to meet in regards to water condition, temperature, lighting, heating and water movement. 2. Something just as important as research is patience. Setting up a reef tank takes time, you need to relax and go slow. Many reef tanks go wrong right from the start because people rush into setting up their reef tank. If you do not allow the nitrogen cycle to take place then you will have major problems very early on with the levels of toxins in your reef tank. Also when adding fish and/or live rocks do so in stages and not all at once, let each one get used to the new reef tank and used to each other. This way they are more likely to live together peacefully. 3. A lot of testing is required when setting up a reef tank. The water conditions in your reef tank will determine whether it is going to be a successful set up of a reef tank. Special attention needs to be paid to the levels of all toxins when setting up a reef tank. However if you keep a close eye on the water condition and test it often (around every 3 to 4 days) then it can be very easily maintained. There are many products on the market which can help with controlling the levels of toxins and other things which affect the water condition. You just need to keep on top of it and you won’t go wrong. 4. Water temperature also needs to be correct when setting up a reef tank. The temperature is usually something between 25 and 28 degrees Celsius (75 to 82 degrees Fahrenheit). Most tanks will come with a heater that will be sufficient to do this. I recommend placing a thermometer on the inside of the tank so that you can keep a close eye on this and either turn your heater up or down if needed. 5. After you have researched which fish and live rock you will be setting up your reef tank with you will need to know what their light requirements are. Lighting is very important when setting up a reef tank as every species differs greatly and need different intensity of light. This is truer of soft corals which if not given the right amount of light will not survive in your reef tank. They range from needing very little lighting to moderate lighting to needing very strong lighting for photosynthesis. So again I stress the importance of research when setting up a reef tank. 6. 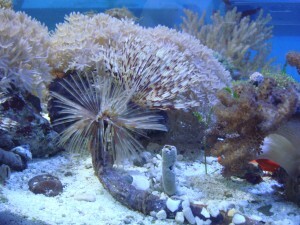 Water movements in reef tanks can be gained from filters pumping out water. However some fish and live rocks need more water movement then others just like with lighting. So making sure you have a water pump is a must when setting up a reef tank. This will mimic the movement of the sea and will help keep your reef tank and everything in it a lot happier and healthier for longer. 7. Although filters are a must in all tanks most people do not realise the primary filter is already in your reef tank, live rock. If you have very delicate corals in your reef tank I would suggest staying away from mechanical filtration as these can cause more nitrate in your water. This will stunt growth in your reef tank and may lead to killing the more delicate corals. Another aspect of filtration which is useful to know about is using a deep sand bed. This will help to reduce nitrates and waste within your reef tank. 8. Something people tend to over look when setting up a reef tank is safety. Make sure you use all of your equipment as the manufacturer’s instructions tell you. Whenever it is possible place electrical equipment out of the water. Make sure when setting up a reef tank you always use drip loops as well. If you travel a lot you may also want to consider home monitoring systems. These come with water sensors so can help prevent potential disasters. They give you that bit of extra reassurance that your reef tank is set up safely. 9. When setting up a reef tank many people are under the false impression that the more they feed the faster the tank will grow. This is of course not the case at all. In fact overfeeding can have the opposite effect, it can stunt growth or worse, lead to death. The best thing to do is feed little and often. This will help keep the water condition right which will in turn keep your fish and live rock happy and healthy for longer. It will also make cleaning the tank a lot easier as the amount of waste products in the water will not be as high. 10. Finally, when setting up a reef tank you need to make sure you are committed to cleaning and water changes. A normal set up reef tank should have 10 to 20 percent of the water changed every week. However if you notice the condition of your water is not right then you should do these more frequent until this is resolved. I would suggest doing a 10 to 20 percent water change every 3 days until the water condition is back to an acceptable level. Perrys Aquatic Centre in Dunholme near Lincoln have experts on hand who will be willing to help with any questions you might have. They offer FREE water testing services. They also have a wide range of stock and provide excellent customer service.